"Fermentation is essentially controlled decomposition so kombucha, like all fermented foods, should be subject to your own judgement. 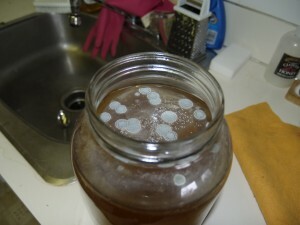 If you smell or see something funky in your kombucha, please trust your senses and refrain from consuming it!" However, many of the beginning stages of a successful kombucha brew can look like mold, especially to the beginner brewer. Therefore, my advice to new brewers is to wait it out. If you are still unsure or uncomforable consuming the kombucha at the end of the fermentation time I would suggest making a new batch with the baby to see if the problem occurs again. Before brewing a new batch, cut the baby SCOBY in half as mold will usually make itself known in the form of a thin line of blue/black (reminscent of a mold line in cheese). Check out my new tumblr: www.scobyland.tumblr.com for pictures of beautiful healthy SCOBY. 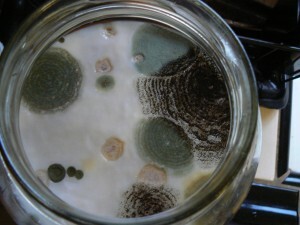 (Source) Here are two photos of moldy SCOBY.